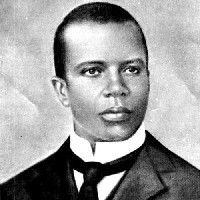 According to The New Penguin Dictionary of Music, " Scott Joplin was an American composer and pianist whose ragtime compositions for piano had revived a vogue in the 1970's; also composed operas "A Guest of Honour" (lost) and "Treemonisha" (not performed till 1972)". This is the terse entry for this man, the most illustrious of ragtime composers. It reflects practically nothing of the trials and tribulations, the achievements of this genius and the man's musical legacy. Scot Joplin was born in Texarkana on the Texas side, his father, Giles Joplin, being a railway workman hailing from North Carolina. He was born a slave, freed in 1863, just five years before Joplin's birth. He was very musically minded, playing the violin and promoted the interest in music within his family. Joplin's mother, Florence Givens Joplin, was freeborn, raised in Kentucky, and in addition to raising five other children was a laundress, singer and banjo player. The young Scot Joplin's talents were such that his father, despite more pressing family demands, purchased a battered old piano. Julius Weiss, a local German music teacher, was an early benefactor giving free lessons in piano playing and harmony. After his mother's death, he left home at the age of fourteen to wander through Texas and Louisiana, up and down the Mississippi playing in unsavoury surroundings. He later studied music at the George Smith College, Sedalia and became famous as a pianist in Chicago and St Louis in the 1890s. During that period he became obsessed with and longed for recognition as a serious composer. He made ragtime a national craze in 1899 with his Maple Leaf Rag (1899). It was his publisher, John Stark who titled him King of Ragtime following this success. Joplin then continued to compose almost seventy works including the two operas named above. He died, a tragic figure, broken, exhausted in his failed operatic endeavours to launch Treemonisha. His work experienced a renaissance in the 1970s when his The Entertainer became widely known through the film "The Sting" and the efforts of Joshua Rifken in bringing ragtime music to the concert platforms and through his many recordings. Scott Joplin is a great inspiration to me. I have poured through his piano scores repeatedly, and, in more recent times, compared them with various midi files which can be accessed all over the Internet. Initially, I adapted just one of his works, The Augustan Club Waltzes (1901) for recorder sextet in 1998 but now (June 2002) have finally got round adapting his complete works as can be seen from the sheet music list below. Further reading:The webpage Ragtime Books lists a comprehensive list of books about ragtime. Scott Joplin International Ragtime Foundation A massive site dedicated to Scott Joplin. Midi World Classical Music Midis for S. Joplin. Scott Joplin (1868-1917) has at least 157 item(s) at the Amazons which you can order on-line by clicking the item's order icon. Printed: 1995. Sheet Music 41 pages. Limited availability. For treble recorder & piano. Printed: 1996. Sheet Music 26 pages. Limited availability. For alto (or tenor) saxophone & piano. Printed: 1990. Sheet Music. Limited availability. Printed: 1997. Turtleback 36 pages. Limited availability. Schott Piano Classics are new and proven piano editons from Bach to Satie; available at affordable prices with introductions in English, French and German. Contents: The Entertainer * Elite Syncopations * Original Rags * Pine Apple Rag * The Cascades * Maple Leaf Rag. Printed: 2006. Paperback 63 pages. Limited Availability. Printed: 1986. Sheet Music. Limited availability. Printed: 1999. Paperback. Limited Availability. Forty-three of Joplin's best rags, with introductory remarks and exercises to assist players. Titles include: Bethena * The Cascades * The Easy Winners * Elite Syncopations * The Entertainer * Maple Leaf Rag * Palm Leaf Rag * 'Solace' A Mexican Serenade * Swipesy * Weeping Willow. Printed: 1974. Sheet Music. Limited availability. Arranged for brass band. Conductor [and parts]. Printed: 1976. Sheet Music 27 pages. Limited availability. Printed: 1984. Sheet Music. Limited availability. Arranged for Descant, Treble and Tenor Recorders. Printed: 1976. Sheet Music 21 pages. Limited availability. Printed: 1994. Sheet Music 6 pages. Limited availability. For Soprano (or tenor) Saxophone or Saxophone or Clarinet & Piano. Printed: 1976. Sheet Music 20 pages. Limited availability. Printed: 1976. Sheet Music 19 pages. Limited availability. Printed: 1968. Sheet Music. Limited availability. By Scott Joplin, Co-Author: Scott Hayden , Arthur Marshall , Louis Chauvin and Joseph F. Lamb . Printed: 1978. Sheet Music 24 pages. Limited availability. Printed: 1971. Sheet Music. Limited availability. Printed: 1982. Hardcover. Limited Availability. This book contains a collection of the some of the best music, and tops it off with an informative preface on Joplin's work and sheet music cover images of every song. Printed: 1981. Sheet Music 327 pages. Limited availability. The American collection music series. Printed: 1982. Sheet Music. Limited availability. Printed: 2001. Sheet Music 288 pages. Limited availability. American classical guitarist Giovanni de Chiaro made his New York debut in 1976 in a Carnegie Hall performance which brought a rave notice from the New York Times and launched a career of growing distinction. He has concertized throughout the United States, Mexico and Europe and has performed for Pope John Paul II at the Vatican in Rome. He was invited to perform for President Clinton at a special Christmas function at the White House. His recordings include his arrangements of Christmas carols, Broadway classics, and the complete works of Scott Joplin. In 1989, Mr. De Chirao received a commission from NASA to compose an original guitar composition for the Space Shuttle program. The editors of the prestigious national journal Musical America named Giovanni de Chiaro as one of the magazine's "Young Artists of the Year" in 1982. He is a contributing editor to guitar magazines published in both the United States and abroad. Giovanni has recorded two nationally televised special programs for the PBS network. Both of these programs received Gold Awards and top honors at several film festivals. His many recordings can be heard throughout the United States on National Public Radio. De Chiao is currently the professor of guitar at the University of Southern Mississippi in Hattiesburg, Mississippi. Printed: 1909. Sheet Music. Limited availability. Printed: 1978. Sheet Music 35 pages. Limited availability. Printed: 1990. Sheet Music 8 pages. Limited availability. The Easy Winners A rag time two step. Printed: 1974. Sheet Music 5 pages. Limited availability. Music by Scott Joplin. Words by: Herbert Chappell.. Printed: 1975. Sheet Music 16 pages. Limited availability. Printed: 2000. Sheet Music 3 pages. Limited availability. Printed: 1990. Sheet Music 5 pages. Limited availability. Printed: 1984. Sheet Music 3 pages. Limited availability. The Entertainer A ragtime two step. Printed: 1974. Sheet Music 3 pages. Limited Availability. Easy piano solo. - Intermediate piano solo. - For all organs. Simplified edition. - Modified piano edition. Editor/Arr. : Edited by Gunther Schuller. Printed: 1974. Sheet Music 4 pages. Limited availability. Theme from the film "The Sting". Printed: 1975. Sheet Music. Limited availability. Clarinet trio and piano. Score and parts. Arr. for flute trio and piano. Score and parts. An excerpt for flute and guitar. Score. Printed: 1976. Sheet Music. Limited availability. Printed: 1977. Sheet Music. Limited availability. Arr. for instrumental ensemble. Piano/conductor [and parts]. Music by Scott Joplin. Words by: Bob Gumer. Modified piano edition with words. Music by Scott Joplin. Words by: John Brimhall. Music by Scott Joplin. Words by: Richard Graves. Printed: 1975. Sheet Music 7 pages. Limited Availability. Printed: 1989. Sheet Music. Limited availability. Printed: 1976. Sheet Music 5 pages. Limited availability. Featured in the MCA Universal Picture "The Sting". (Below the Break) arranged for Clarinet & Piano. Printed: 2001. Sheet Music 7 pages. Limited availability. Printed: 1905. Sheet Music. Limited availability. The Favorite A ragtime two-step. Printed: 1962. Sheet Music 4 pages. Limited availability. Printed: 1908. Sheet Music. Limited availability. Printed: 1984. Sheet Music 64 pages. Limited availability. Printed: 1985. Paperback 20 pages. Limited Availability. Printed: 1985. Sheet Music 20 pages. Limited availability. Printed: 1915. Sheet Music. Limited availability. Printed: 1907. Sheet Music. Limited availability. Publisher: R. Smith & Co. Printed: 1978. Sheet Music. Limited availability. Printed: 1976. Sheet Music 28 pages. Limited availability. Printed: 1998. Sheet Music. Limited availability. American popular music at its classical best! This is a complete edition of these wonderful piano pieces, all newly engraved. 42 of Joplin's most famous rags in one comprehensive collection, including: Bethena * The Easy Winners * The Entertainer * Eugenia * Maple Leaf Rag * Original Rags * Solace * Something Doing * and many more. Printed: 2006. Sheet Music 64 pages. Usually dispatched within 11 to 14 days. Printed: 2006. Paperback 44 pages. Limited availability. Printed: 1999. Sheet Music. Usually dispatched within 24 hours. Printed: 1999. Sheet Music 4 pages. Limited availability. Printed: 1914. Sheet Music. Limited availability. Publisher: Herman Darewski Music Publishing Co. Printed: 1957. Sheet Music. Limited availability. Printed: 1978. Sheet Music 3 pages. Limited availability. Printed: 1961. Sheet Music. Limited availability. Arranged for Solo Bb cornet. Printed: 1976. Sheet Music 24 pages. Limited availability. Printed: 1950. Sheet Music 5 pages. Limited availability. Revised music and lyrics by Jule Styne and Bob Russell. Printed: 2002. Sheet Music 4 pages. Limited availability. Printed: 1975. Sheet Music 66 pages. Limited availability. For piano. Selected and with a preface by Max Morath . Printed: 1903. Sheet Music. Limited availability. Printed: 1974. Sheet Music 48 pages. Limited availability. Printed: 2000. Paperback. Special Order. Printed: 1993. Sheet Music. Limited availability. Printed: 1913. Sheet Music. Limited availability. Printed: 1975. Sheet Music 20 pages. Limited availability. By Scott Joplin, Thomas Million Turpin . Printed: 1986. Paperback 28 pages. Limited availability. Contents: Bowery Rag (Turpin) * The Chrysanthemum * The Easy Winners * The Entertainer * Harlem Rag (Turpin) * Something Doing * The Strenuous Life * Weeping Willow. Printed: 1977. Sheet Music 28 pages. Limited availability. Printed: 1998. Paperback 140 pages. Usually ships within 2-3 days.. Printed: 1975. Sheet Music 35 pages. Limited availability. Arranged for guitar ensemble. Score. Printed: 1996. Sheet Music 20 pages. Limited availability. Arranged for alto or tenor saxophone & piano. Printed: 1993. Sheet Music 22 pages. Limited availability. Arranged for clarinet & piano. Printed: 1984. Sheet Music 12 pages. Limited availability. Contents: The Entertainer * Scott Joplin's New Rag * The Easy Winners * Pleasant Moments * The Cascades. Printed: 1999. Sheet Music. Limited availability. Arranged for Recorder Quartet (SATB). Printed: 1985. Sheet Music 16 pages. Limited availability. Printed: 1985. Sheet Music 44 pages. Limited availability. Printed: 1978. Sheet Music 62 pages. Limited availability. 20 Scott Joplin favorites for flute/recorder/oboe/violin/mandolin/ harmonica with guitar chords. Printed: 1986. Sheet Music 44 pages. Limited availability. Ragtime for Violin. 6 Scott Joplin hits. Printed: 2005. Sheet Music 154 pages. Limited availability. Printed: 1979. Sheet Music 7 pages. Limited availability. The Entertainer, Maple Leaf Rag, Weeping Willow. For Guita solo. Printed: 2002. Sheet Music 31 pages. Special Order. Printed: 1972. Sheet Music 159 pages. Limited availability. Printed: 1974. Sheet Music 32 pages. Limited availability. Printed: 1975. Sheet Music 32 pages. Limited availability. Printed: 1996. Sheet Music 160 pages. Limited availability. 35 titles, including: The Entertainer * Maple Leaf Rag * Harmony Club Waltz * Peacherine Rag * Elite Syncopations * Bethena * more. Includes biography. Printed: 1988. Sheet Music. Limited availability. Printed: 1985. Paperback 35 pages. Usually dispatched within 1 to 3 weeks. A collection of ten transcriptions for the guitar of classic rags by Scott Joplin, the greatest and most inspired of all ragtime composers. The works selected for this volume are an excellent cross-sampling of Joplin's rags. Titles include: The Entertainer * The Cascades * Maple Leaf Rag. Printed: 1976. Sheet Music 34 pages. Limited availability. Printed: 1991. Sheet Music 8 pages. Limited availability. Printed: 1991. Sheet Music 48 pages. Limited availability. 12 of the best from "The King of Ragtime," complete with an introduction, a biography, and extensive playing tips to help the beginning ragtime player. Songs include: The Entertainer * Maple Leaf Rag * Bethena * The Easy Winners * and more. Printed: 1945. Sheet Music. Limited availability. Printed: 1912. Sheet Music. Limited availability. Printed: 1974. Unknown Binding 128 pages. Limited Availability. Printed: 1984. Paperback 64 pages. Usually ships within 2-3 days.. Printed: 1979. Sheet Music. Limited availability. Printed: 1979. Sheet Music 54 pages. Limited availability. Printed: 1980. Sheet Music. Limited availability. For flute (or clarinet) & piano. GM889b: Maple Leaf rag, The Easy Winners, The Strenuous Life, Cleopha, The Sycamore, The Cascades. GM889c: Peacherine Rag, A Breeze from Alabama, Palm Leaf Rag, Eugenia, Leola, Bethena. Printed: 2001. Paperback 64 pages. Usually ships within 24 hours.. In addition to the title piece, a syncopated tango included in the soundtrack of the movie The Sting, this compilation features 10 other (mostly nonragtime) pieces: "Great Crush Collision," "Combination March," "Harmony Club Waltz," "Augustan Club Waltz," "March Majestic," "Bethena," "Rosebud," "Binks' Waltz," "Antoinette," and "Lily Queen." Reproductions of original sheet-music covers. Printed: 1985. Sheet Music 23 pages. Limited availability. Book Description br Easy arrangements of 10 rags from this award-winning movie, including: The Easy Winners * The Entertainer * Gladiolus Rag * Luther * Solace * and more. Printed: 1991. Sheet Music 40 pages. Usually dispatched within 24 hours. Printed: 1910. Sheet Music. Limited availability. For brass ensemble (4 Bb trumpets [sic], 4 trombones, baritone, tuba). Printed: 1978. Sheet Music 88 pages. Limited availability. For string quartet with double bass, guitar and piano ad-lib. or string orchestra with guitar and piano ad-lib. Score. By Scott Joplin, Scott Hayden . Printed: 1974. Sheet Music 16 pages. Limited availability. Printed: 2007. Sheet Music 40 pages. Special Order. Printed: 1996. Sheet Music 600 pages. Limited availability. Printed: 1995. Sheet Music. Limited availability. Gr 2-6: This oversized illustrated book is based on Scott Joplin's opera of the same name. Set in September, 1884, on an abandoned plantation in a remote, wooded corner of Arkansas, the story concerns the lives and hopes of former slaves. Treemonisha, born soon after emancipation, has been well educated, thanks to her parents' hard work and her own determination. Now a young woman recently returned from college, she clashes with the local conjure man, who has been breeding ignorance and superstition among her neighbors for his own profit. The excitement increases when he kidnaps Treemonisha and threatens to throw her into a wasps' nest. Because the motivations of the characters and the flow of action in Treemonisha are easily accessible to children, it translates well into a picture book. This retelling follows the opera's action closely, sometimes using dialogue from Joplin's libretto. Watercolor illustrations depict mysterious woods in muted fall tones and make effective use of expression and gesture to portray human emotion. The pictures are notable for their strong sense of movement, recalling the opera's energetic ragtime dance numbers. An introduction offers background information, while an afterword outlines Joplin's life and recounts the history of his only surviving opera. Standing on its own as a good story, this title provides an enticing introduction to an appealing and important piece of American music. Words and Music by Scott Joplin. Printed: 1911. Sheet Music. Limited availability. Printed: 1975. Sheet Music 95 pages. Limited availability. Printed: 2001. Paperback. Usually ships within 24 hours.. Praised by The New York Times as gently imbued with ragtime, but aspiring "to genuine operatic richness," Scott Joplin's energetic opera tells of a confident young woman whose life, in many respects, paralleled the composer's. The pioneering work appears here in a handsome and inexpensive edition, sure to delight soloists, rehearsal pianists, and Joplin enthusiasts. "The Entertainer" and "Ragtime Dance" for Woodwind ensemble. Score in C [and parts]. St. Louis Ragtimers Full Steam Ahead and Loaded Up! "Perfessor" Bill Edwards Don't Jazz Me - I'm Ragtime! For soprano. (alto, tenor) recorder, accompaniment CD. 10 Rags for Sop. (Alto,Tenor) recorder (or Oboe). Includes accompaniment CD. Contains The Ragime Dance, Pine Apple Rag, and Original Rags. Score and Parts. 20 pages. For C instrument duet (flute, recorder, oboe, violin, mandolin, harmonica). For 3 D (timpani) recorder (3 oboe). Set of parts: "The Entertainer," "New Rag," "Ragtime Dance," and "Fig Leaf Rag.". Set of Parts in Groups. This edition: ED 12323-01. Arr./Editor: Forrest Buchtel Level: Grade 2.5. Score and Parts ISBN M-50144-082-5. Set of Parts in Groups.